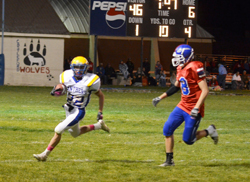 Rolling along with tough defense and balanced offense, the Carey High School eight-man football team piled up 556 total yards and routed the Castleford Wolves 52-6 Friday in a key Sawtooth Conference West Division clash, at Castleford. Panther sophomore Toby Whitworth rushed for a game-high 114 yards and two touchdowns while older brother Matt Whit-worth, a senior, added two rushing TDs after the half to help Carey pull away and stay unbeaten for the year. Senior quarterback Nate Adamson (291 all-purpose yards) led the Panthers with 65 rushing yards and 226 passing yards and two TDs on just seven completions. He also intercepted a Wolves pass and made 10 unassisted tackles. Castleford (4-3, 2-2 league) scored first, but junior Joe Parke (4 catches, 183 yards) put the Panther offense in motion with a 74-yard pass reception from Adamson on Carey’s first play. Ad-amson’s interception stopped a Castleford drive at the 3-yard-line and Carey was on its way. The eight-touchdown win combined with Lighthouse Chris-tian Academy’s 76-36 home victory over Camas County of Fairfield in Twin Falls Friday set up a match-up of unbeaten teams for the Sawtooth West championship. That game between Carey (7-0, 4-0) and Lighthouse (7-0, 4-0) is set for Friday, Oct. 24 at 7 p.m. at Carey’s Derrick Parke Me-morial Field. It is “Senior Night” for five Panthers as well as Lighthouse’s first-ever varsity trip to Carey’s turf. Kirkland expects a strong challenge from Lighthouse. He said Lions’ two-time All-State running back and linebacker Adam Taylor—the senior called by Kirkland a “great athlete, great competitor”—broke his arm during Friday’s win over Camas County. Castleford—Tony Hunsaker, 20-yard run (pass failed); (6-0 Castle). Carey—Collin Whitby, 9-yard pass from Nate Adamson (no conversion); (6-6). Carey—Toby Whitworth, 21-yard pass from Nate Adamson (no conver-sion); (12-6 C). Carey—Toby Whitworth, 5-yard run (no conversion); (18-6 C). Carey—Nate Adamson, 18-yard run (no conversion); (24-6 C). Carey—Nate Adamson, 4-yard run (Adamson run); (32-6 C). Carey—Matt Whitworth, 1-yard run (no conversion); 5:19 1st (38-6 C). Carey—Matt Whitworth, 3-yard run (Matt Whitworth run); (46-6 C). Carey—Toby Whitworth, 23-yard run (no conversion); (52-6 C). Rushing—Toby Whitworth 16-114, 2 TD; Nate Adamson 9-65, 2 TD, 1 conv. ; Matt Whitworth 13-48, 2 TD, 1 conv. ; Joe Parke 1-12; Parker Gamino 2-9; DJ Parke 1-5. Passing—Nate Adamson 7-14, 226 yards, 2 TD; Toby Whitworth 1-1, 11 yards; Matt Whitworth 1-1, 11 yards. Receiving—Joe Parke 4-183; Collin Whitby 3-33, 1 TD; Toby Whitworth 1-21, 1 TD; DJ Parke 1-11. All-purpose yardage—Nate Adamson 291, Toby Whitworth 146. Interceptions (2)—Dallin Dilworth 1 with a 39-yard return; Nate Adamson 1-2. Sacks (3)—Chris Peck 2, Nate Adamson 1. Tackles/assists—Matt Whitworth 6/6, Nate Adamson 10/1, Dallin Dilworth 5/5, Joe Parke 7/1, Parker Gamino 7/1, Toby Whitworth 7/0, Chris Peck 5/1, Collin Whitby 2/1, Derrick Baird 1-0. Rushing—Tony Hunsaker 20-80, 1 TD; Jonathan Rich 5-43; Colt Zimmers 1-37; Jesse Rodriguez 6-20; Andy March 2-10. Passing—Jonathan Rich 6-16, 59 yards, 2 interceptions. Receiving—Tony Hunsaker 2-15; Jorge Beltran 1-18; Jesse Rodriguez 1-15; Colt Zimmers 1-7; Morgan Shipp 1-4. Kickoff returns—Jonathan Rich 2-31; Colt Zimmers 1-26; Tony Hunsaker 1-7; Morgan Shipp 1-4. Fumble recoveries (1)—Jonathan Rich 1. Tackles/assist leaders—Jesse Rodriguez 10/0, Tony Hunsaker 7/0, Morgan Shipp 5/1, Colt Zimmers 6/0, Alex Neimeyer 4/1, Dyllan Bothof 3/1.